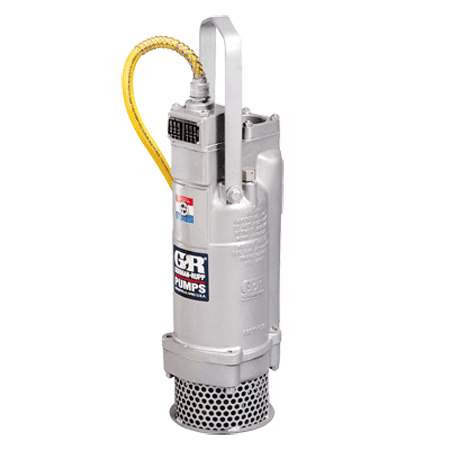 For drilled wells, narrow cofferdams and hard-to-reach places, Gorman-Rupp's Slimline submersible pumps are lighter and easier to handle than their larger Widebase cousins. Even so, there is a strong family resemblance: Gorman-Rupp puts extra protection into the seals, and the impeller is rugged and dependable. Primary seal keeps dirty water in the pump end and prevents contamination of the oil cavity. A second "fail safe" seal provides extra protection against the possibility of damage to the motor. Positive oil lubrication enables the pump to run dry without seal damage. Abrasion resistant ductile iron impellers stand up to sand, gravel and other abrasive materials. The fully shrouded impeller back reduces seal pressure and helps prevent foreign material from entering the seal cavity. Seal life is extended and operational life of the pump is increased. Optional impellers of CD4MCu are available for corrosive/abrasive applications.